Don’t we all have in us a wish to make life simple by eliminating differences between people? Isn’t that what equalism is about – making everyone the same? When we parent our children, when we make the laws of the land, aren’t we wanting to create a neatly safe happy world of right-thinking and right-behaving people? People who are just like us? Thanks largely to computing and the internet, we created and now live in a scary new world of malignantly exploding information, social pressure, and the collection of personal data by Google, by businesses, by government departments, by CCTV etc etc. We’re tribal animals by nature. We are built to live in familiar places and groups, not this huge diverse world at our doorstep connected always through our pocket smart-phone. We’re less prepared for this new world of total information than we were for the motor car. 120 years on and we’re still struggling with that invention. Humans are clever enough to create wonderful technology but not intelligent enough to predict and deal with the consequences. We know that children are supervised far more than they were in earlier tribes, villages or communities. They get used to an adult there to sort out any conflict, to comfort them, to make their lives trouble free. Good parenting is equated with helicopter parenting – even into adulthood, parents believe they should parachute in to smooth their children’s paths. Psychologists have discovered scores more diagnoses for troubles that mean we back off living our lives to the full. That helps explain why young adults at university are so dependent on college staff to ensure a comfortable environment, to create safe spaces with no emotional triggers. But that means these intelligent youngsters don’t get challenged by any new ideas. They don’t learn to think. And then they’re not fit for a job when they enter the real world. And now Jodie Foster’s film “Black Mirror” portrays the ultimate way for a helicopter parent to keep their child forever under ‘protective’ surveillance. Insert a chip in them like you do to a pet. Isn’t that only natural, caring, what any loving parent would do? The answer to all these questions is: No. Our culture of total ‘protection’ is not good, it is not loving or caring. It is not healthy parenting or relationships. That’s why a good enough parent is better than a perfect one. And, no: this world of extreme information and surveillance is not good for adults in their relationships with other people, their work, the world. To get the best out of people, we need to have the best freedom there can be to be and become ourselves, to think for ourselves, to be free to express ourselves. That’s what the best relationships are for. We thrive on the freedom that healthy relationships give us. Égalité combines both liberté and fraternité (that’s good relationships). We are collectively far better off when everyone drives a life that is full of what matters to them. You cannot short cut the development of a child’s infantile dependence – through childhood and adolescent separation and individuation – to the adult’s mature in/dependent relationships with society and mature friends, partners and family. Of course children need support and protection. But not to the exclusion of the space to grow their own minds, personalities and lives. Harmful extremes of coercion and manipulation are found in cults and other coercive groups, and in some couples and families. The coercive controllers of these groups and families often profess that they are doing it for the good of their members and of the world. Just because you think your motives are good, doesn’t mean the way you do it and the outcome will be good. Control and coercion are so harmful they are classed as emotional abuse. So if you short-cut people’s development as individuals, their education, their challenges and opportunities, their freedom to create, to express and to be themselves, then you don’t get equalism. Equalism comes into play only when you have as much diversity as possible. 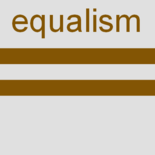 The principles of equalism as we define it – advocacy or support for the principles of equality and respect for difference – paradoxically do not apply except in a world of flourishing diversity. Many now see equalism as a reason to find and abolish any and all the powerful. But diversity means we inevitably live within wide-ranging complex power relationships in all directions. Some are close and dear, some are distant and strange. Our constant task is to work on how power can be constructive and ethical, to ensure power does not get corrupt and destructive. If we turn our constructive ethical powers into an over-wheening unethical power, then we create what is more like a harmful cult. Our group members are subservient to our own image … slaves, cyphers, mini-me’s, sycophants. In that kind of family, children won’t be attached to us in loving safe liberating relationships. They become remotely-controlled pet robots. Thank you for writing this most thoughtful piece. They very idea of inserting a chip into our children for “protective surveillance” makes me shiver. I was recently reading “The Eye” by Vladimir Nabokov and was struck by this short statement in his novella: “it is silly to seek a basic law, even sillier to find it”. So many of the interventions of today (aimed at bringing about better mental wellbeing) seem to me to be based upon a fallacy that we can – as 7 billion human beings – be standardised. This starting point fails in the appreciation of what makes us human: our astonishing diversity. We are sentient beings who are always ‘becoming’. So if we stifle our ‘becoming’ through well-intended, but specialised and restricted approaches, there are bound to be consequences. I am a great admirer of Patrick Geddes. A man from times long past, he had a wonderful outlook based on an appreciation of natural diversity. I long to see the return of Geddesian freedom in approach to learning and wellbeing. Nick, you have so much of Patrick Geddes in you. So I am feeling encouraged. This entry was posted on 7 January 2018 by Nick Child in Ability, Age, Culture, Education, Employment, Equalism in general, Influence, News.